The story goes that back in the 1930’s in India a mother frustrated by her inability to stop her son eating so much sugar dragged him off to see his idol Mahatma Gandhi hoping he’d be able to make the boy see sense. 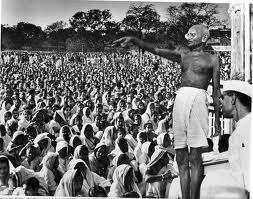 They walked for miles for an audience and when granted one Gandhi is reputed to have said: “Please come back after two weeks and I will talk to your son.” Perplexed the mother wondered why Gandhi hadn’t just told her son to stop eating so much sugar but she dutifully returned 2 weeks later. Gandhi immediately looked the boy in the face and said: “Son don’t eat so much sugar it is bad for your health.” The mother was angry and confused now and demanded to know why Gandhi hadn’t just said this 2 weeks before and according to legend he is supposed to have replied: “Mother, two weeks ago I was eating a lot of sugar myself.” This modern parable gave birth to the saying – Be the change you want to see in this world. Or maybe more aptly for this blog – walking the walk. I was born in Lewisham and went to school in Blackheath and know the area really well. (I was tempted to say with all its echoes of Wat Tyler and the Peasants Revolt I feel it’s my spiritual home but alongside that opening paragraph that would be way too much new age stuff for one blog.) Anyway quite a few years ago Bob Gilbert wrote a book called Green London Way. 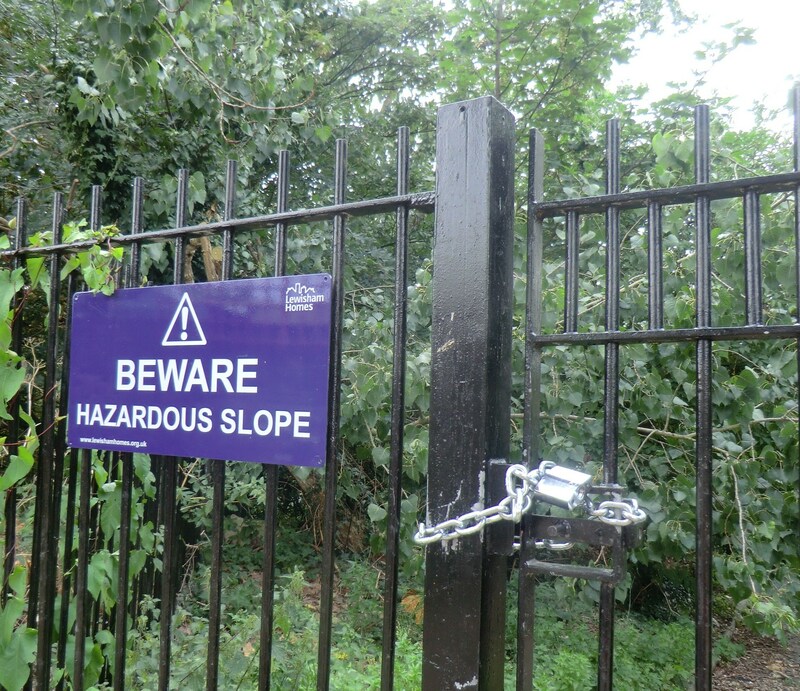 I’m not familiar with the route but when the West Essex Ramblers reported a set of steps going down to the Lethbridge Estate as very dangerous I thought I know the very place. A key part of the Ramblers’ work is ‘to encourage the provision and protection of foot paths and other ways over which the public have a right of way or access on foot, including the prevention of obstruction of public rights of w ay’. A representative of West Essex had informed Lewisham Council of the problem but I thought I’d pop along and have a look. 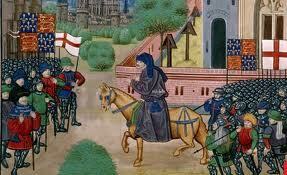 I approached along the edge of the heath and headed for Wat Tyler Road and then Morden Hill. The steps mentioned by the West Essex Ramblers are off a lane that starts here. Well their letter to the Highways Department had presumably prompted some action because the viewing area that the steps led down from was now padlocked off. Undeterred I clambered over the fence and walked down the steps. They were indeed in very bad repair. The exit into the estate was also padlocked off but this time by a gate that was only hip height and a lot easier than many stiles to negotiate. 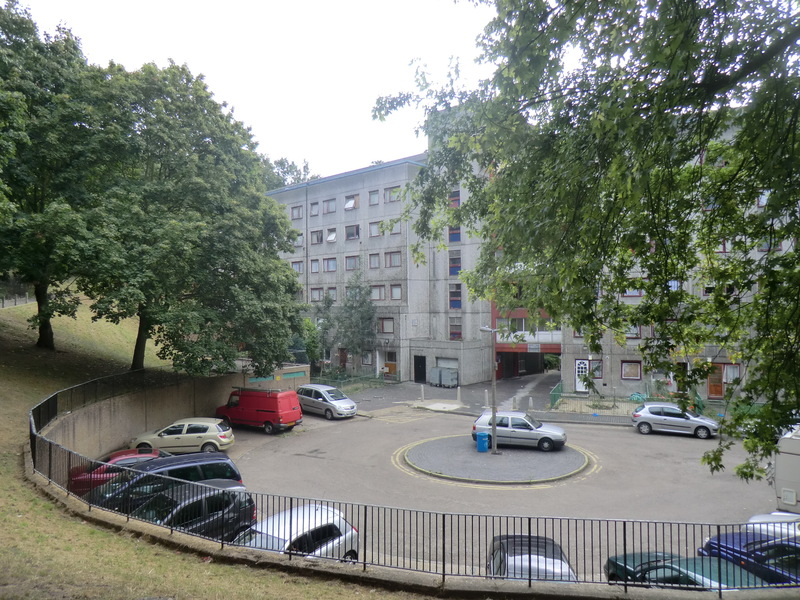 The estate is predominantly grey concrete and was probably built in the late 60’s and now is the subject of major redevelopment. Now I’m not about to suggest that in some pre-lapsarian golden age before wholesale public service cuts Lewisham Council would have maintained these steps but in my mind the real stumbling block to getting this route re-opened is that the council are under no obligation to keep this path open for the public. Under the current legislation the Inner London boroughs (of which Lewisham is one) are excused from having to maintain a definitive map. This map depicts every single right of way within the authority’s boundary and these rights of way are then protected by law. 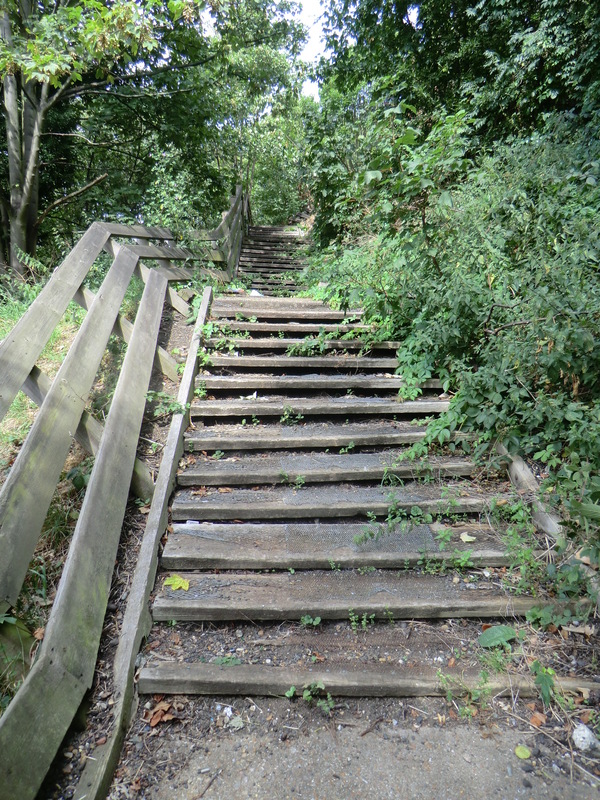 These steps in Lewisham highlight exactly why the Ramblers are running the essential Put London on the Map campaign. In keeping with this theme of activity to encourage change I’m in training for the Grand Union Canal half-marathon being held on Sunday 13 November. I’m running this in aid of the Ramblers so if you support the work they do any donations will be gratefully received. If you give online the money goes straight to them and will be put to use preserving and protecting paths immediately. A link to my sponsor page can be found at the end of this blog . If you are able please dig deep – every little helps. Thanks. And finally on Tuesday 27 September at 7 pm I’ll be leading an evening stroll from Richmond station. 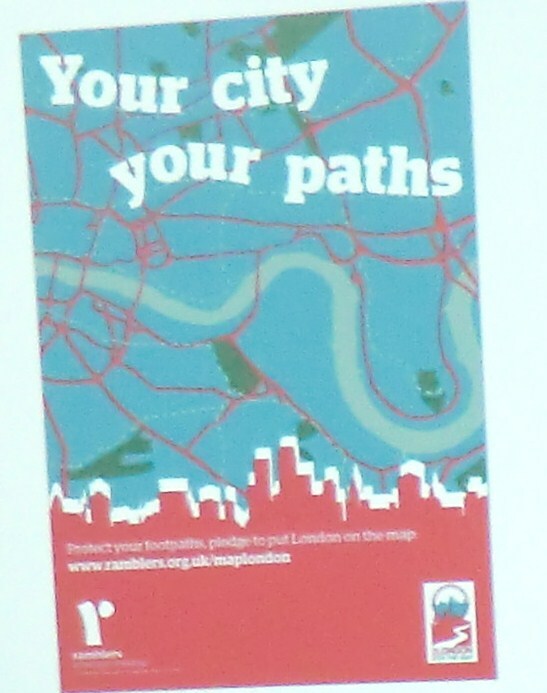 The local MP, Zac Goldsmith, a champion for the environment and friend of the Ramblers will be coming along. Zac was one of only 6 coalition MPs who had the courage to vote against the government during the controversial proposed sale of woods debate this year. Another great example of being the change you want to see in this world. Come along if you can and thank him for this action as well as urging him to do more to preserve our precious footpath network.